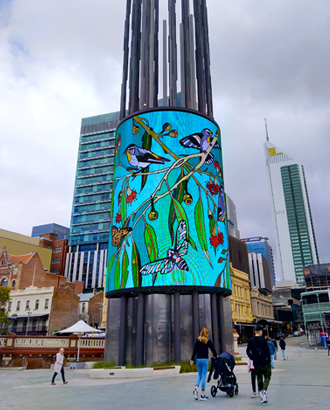 Yagan Square Digital Tower is a unique circular screen at the heart of Yagan Square, highlighted on The New York Times’ list of 52 Places To Go In 2019. The tower is owned by the Metropolitan Redevelopment Authority with the content managed by Screenwest. The 45-metre high tower includes a large circular screen and 14 reeds, inspired by the bulrushes found at the lakes that once occupied the site. The number of reeds represents the 14 Noongar language groups. On the giant screen, you can find anything from animation, to visual artworks, live-streamed events and community pieces.